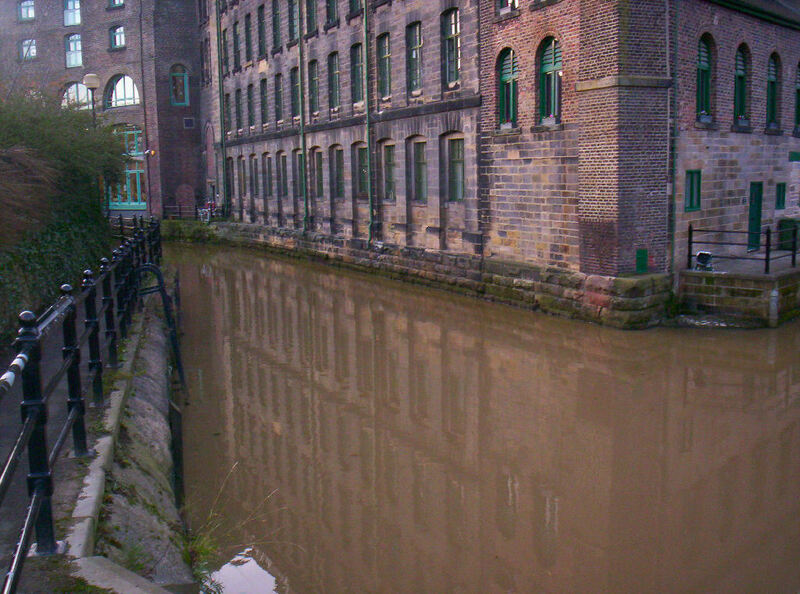 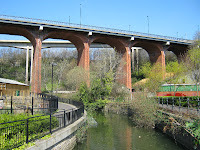 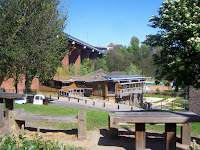 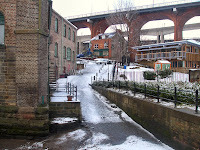 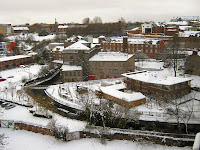 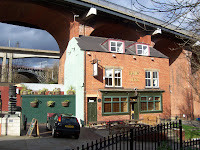 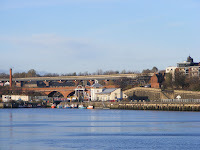 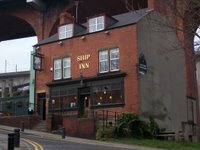 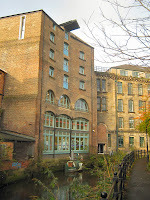 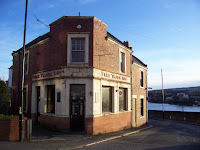 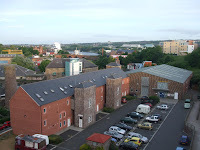 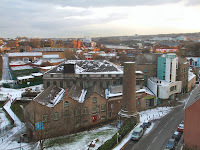 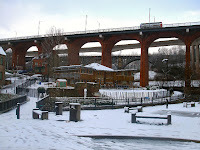 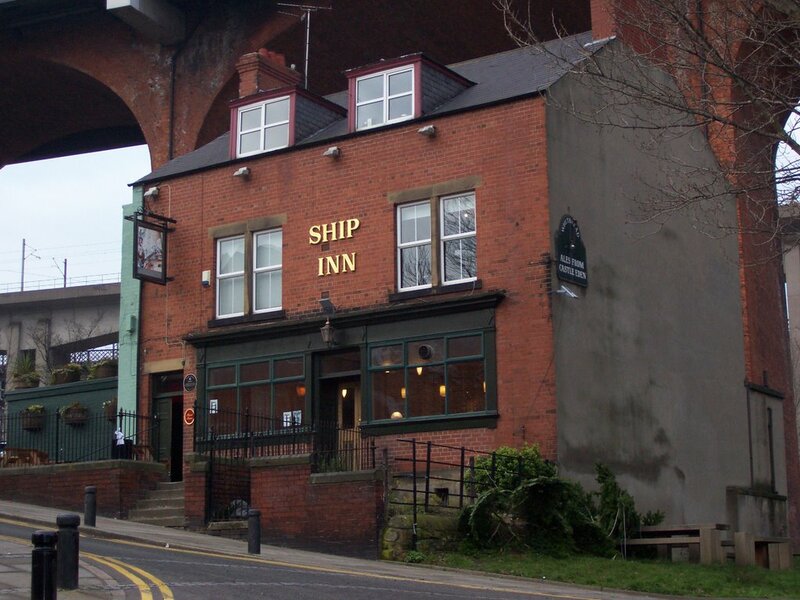 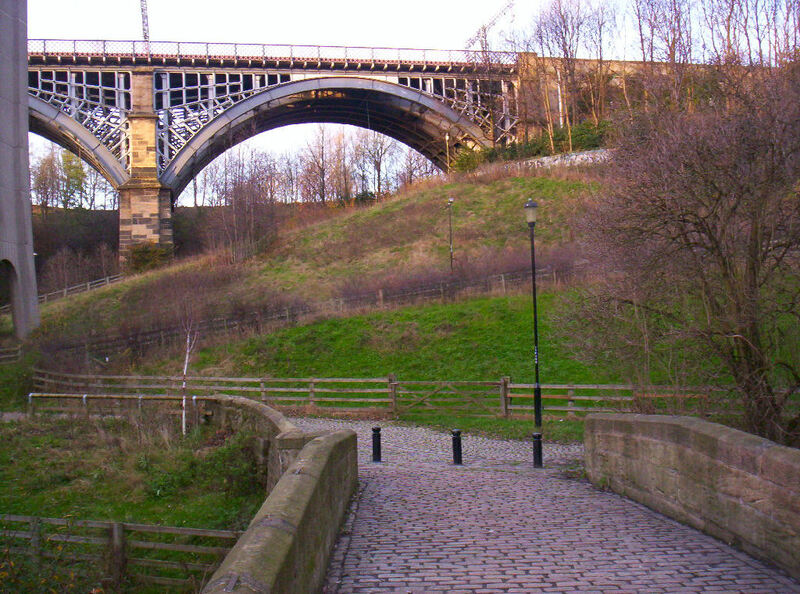 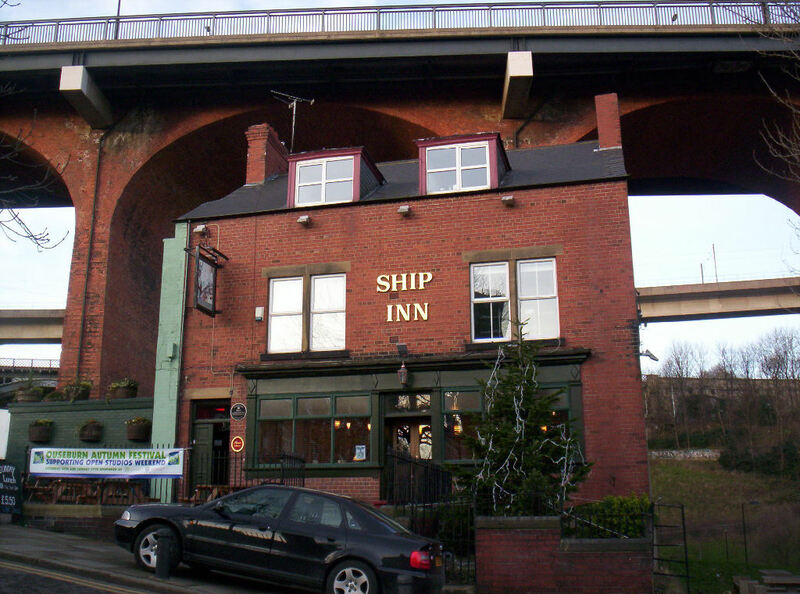 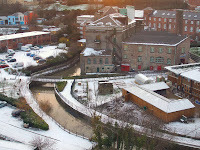 The lower Ouseburn Valley through which Ouseburn river flows is home to a number of pubs (Free Trade - right at the confluence with the Tyne with good view of the bridges looking upriver, The Tyne, the Cumberland Arms, The Ship Inn, Tanners and The Cluny) known locally in the Newcastle area for live music and real ale. 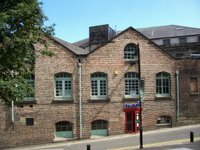 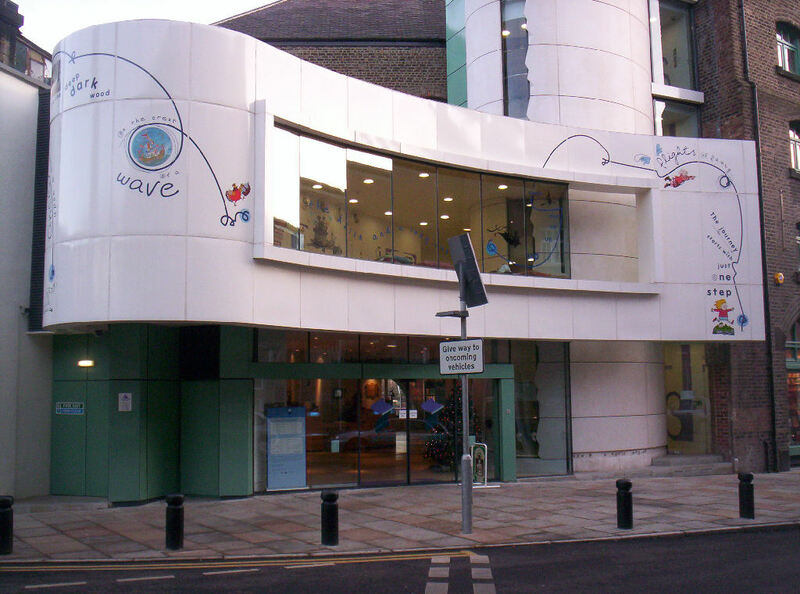 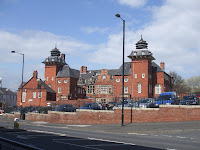 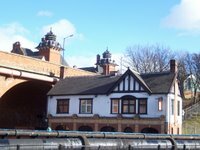 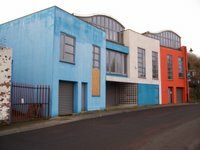 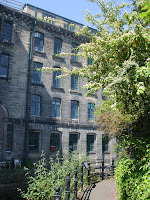 It is also a hub for the arts and creative industries, including the Biscuit Factory (open gallery), the Mushroom Works (open first weekend of the month), Testhouse 5 (appointment only), North Grange Glass (stained glass gallery and cafe), 36 Lime Street and Cobalt Studios. 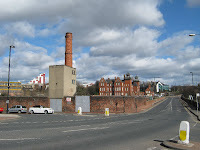 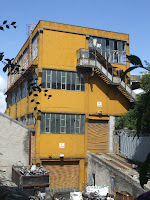 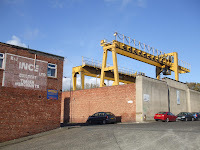 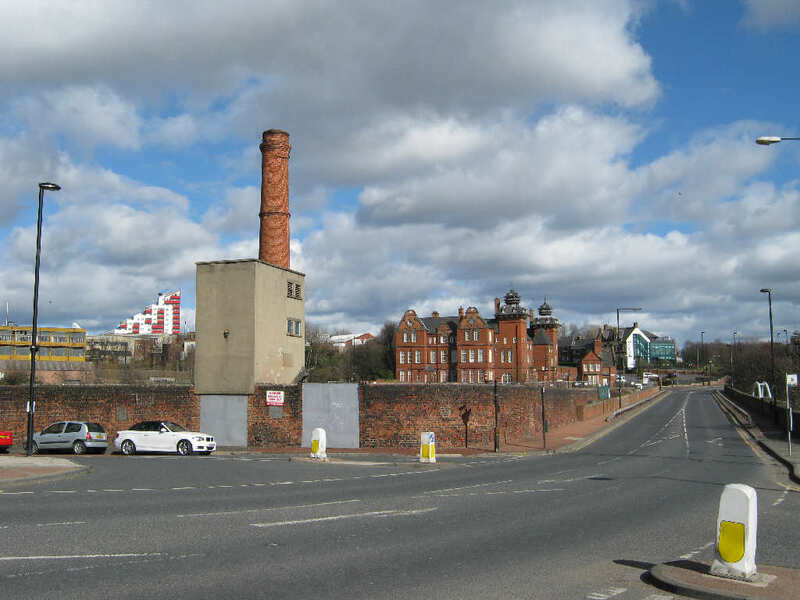 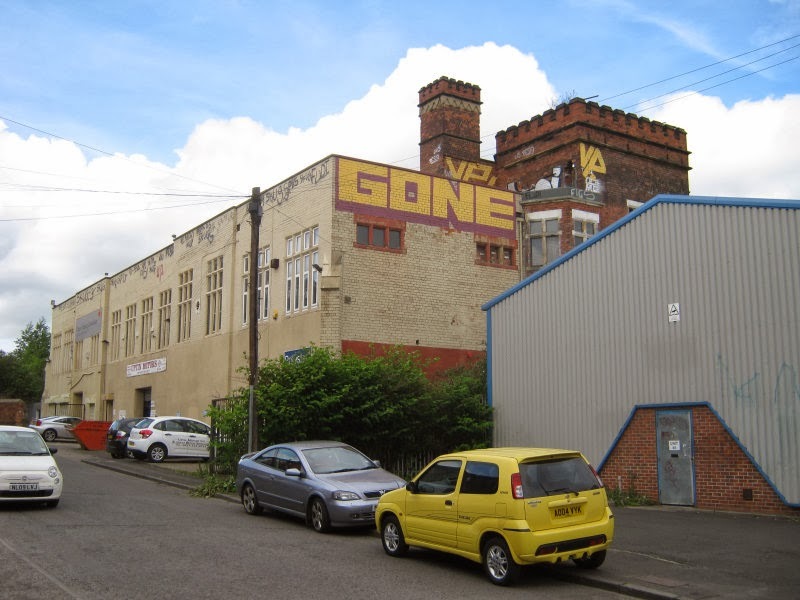 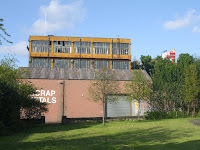 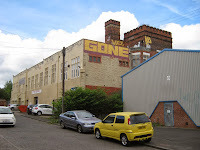 Whilst the area was the cradle of the Industrial Revolution in Newcastle and was once home to many thriving (and very dirty) heavy crafts industries, it fell into disuse and dereliction by the mid-twentieth century. 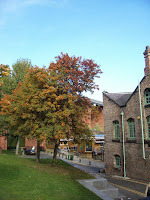 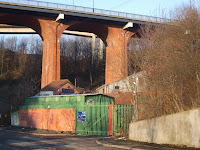 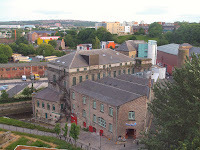 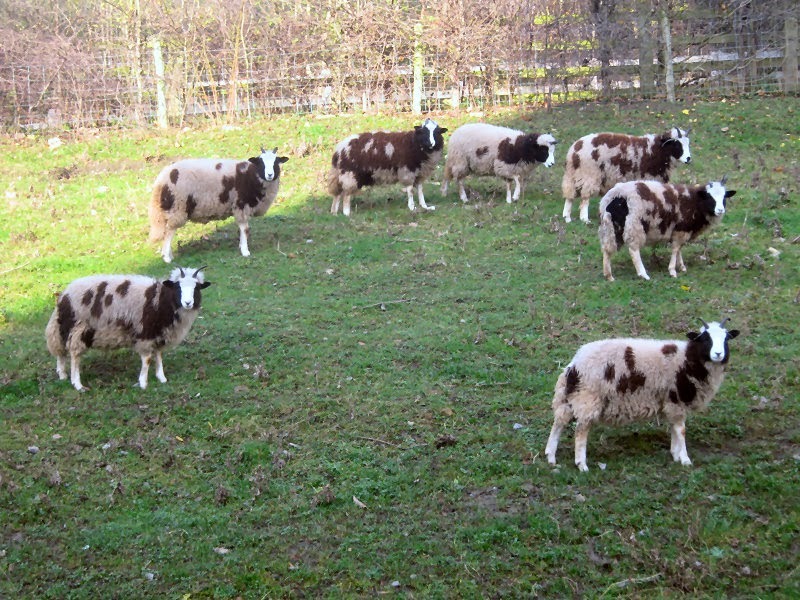 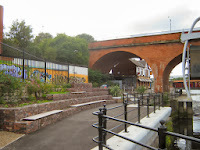 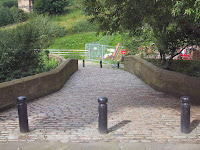 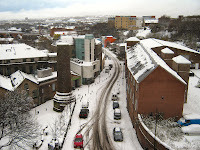 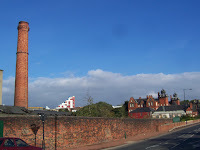 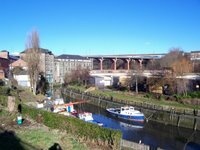 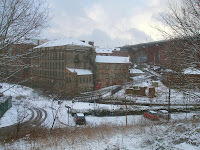 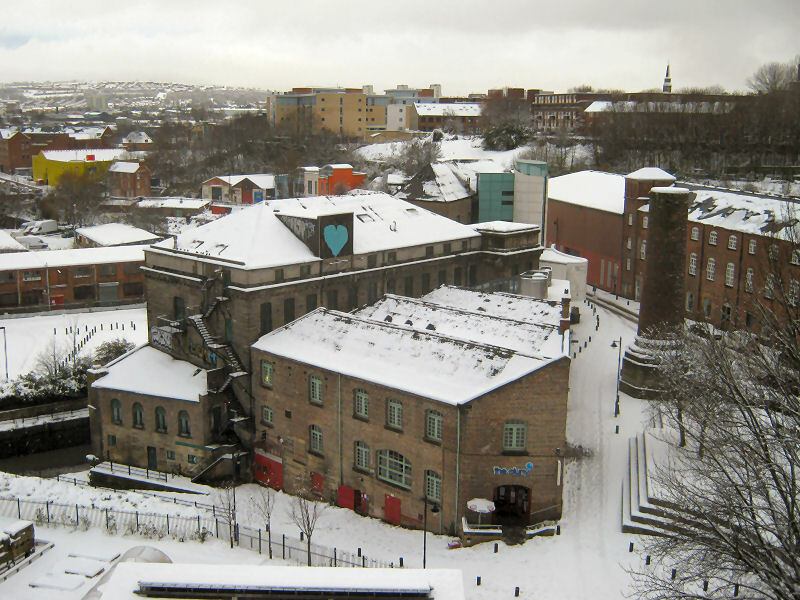 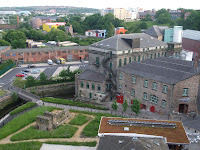 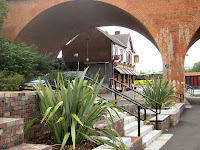 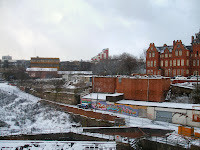 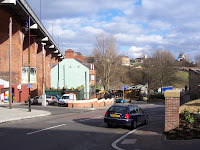 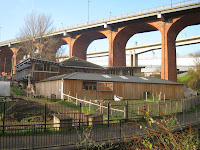 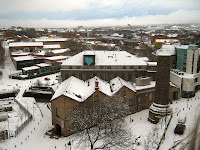 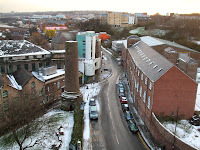 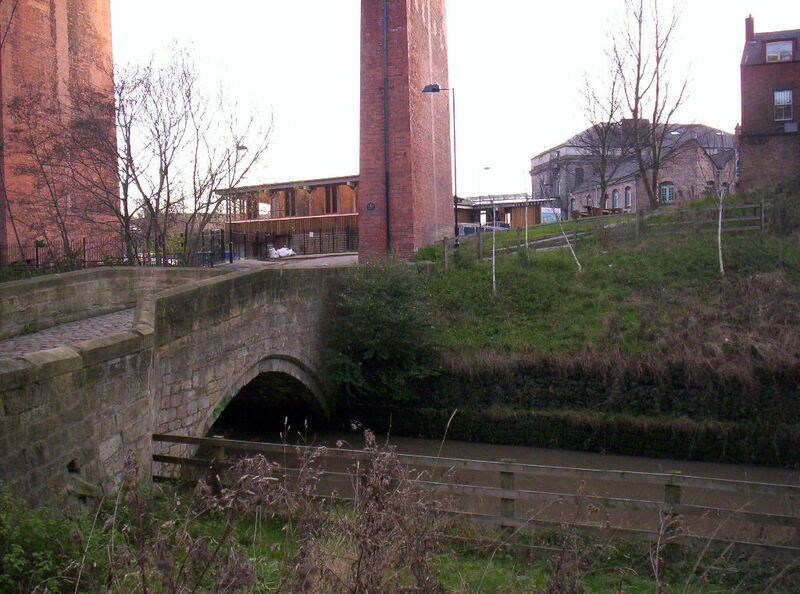 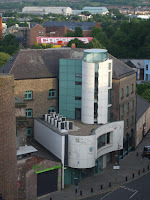 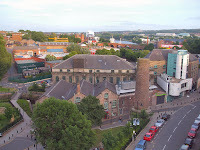 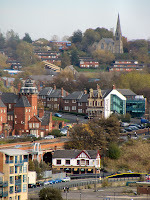 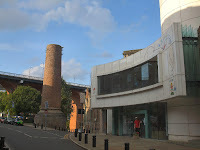 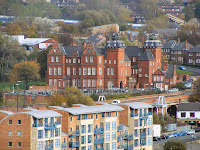 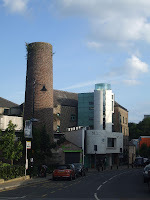 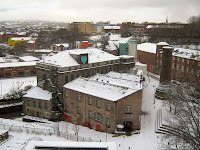 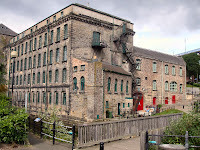 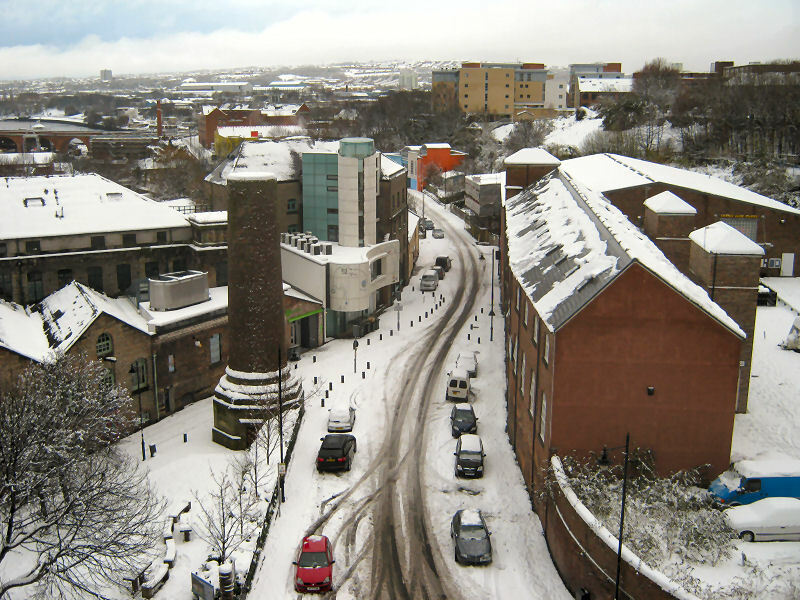 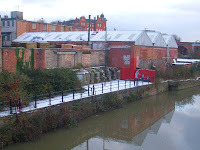 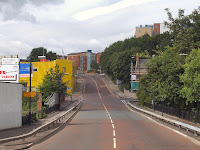 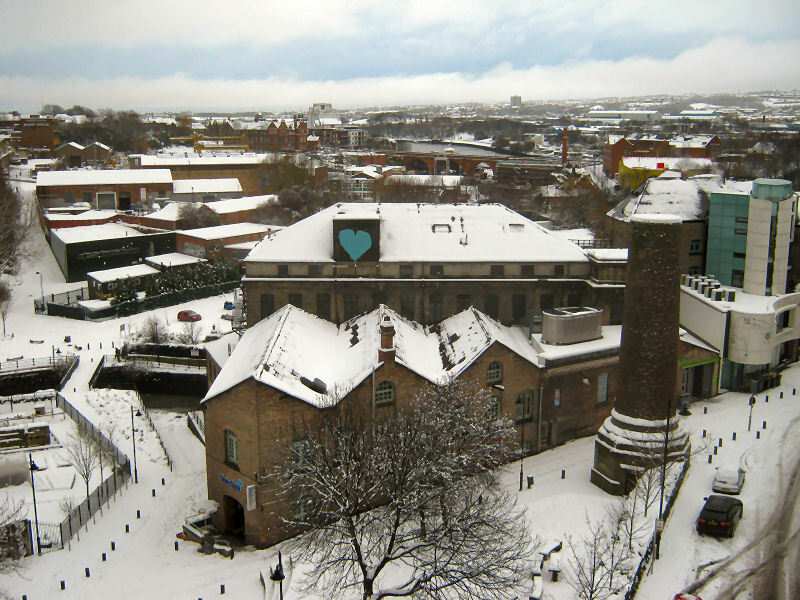 The current incarnation of the Valley as a cultural regeneration hotspot was initiated by the Ouseburn Trust, in partnership with the local authority, in 1996. 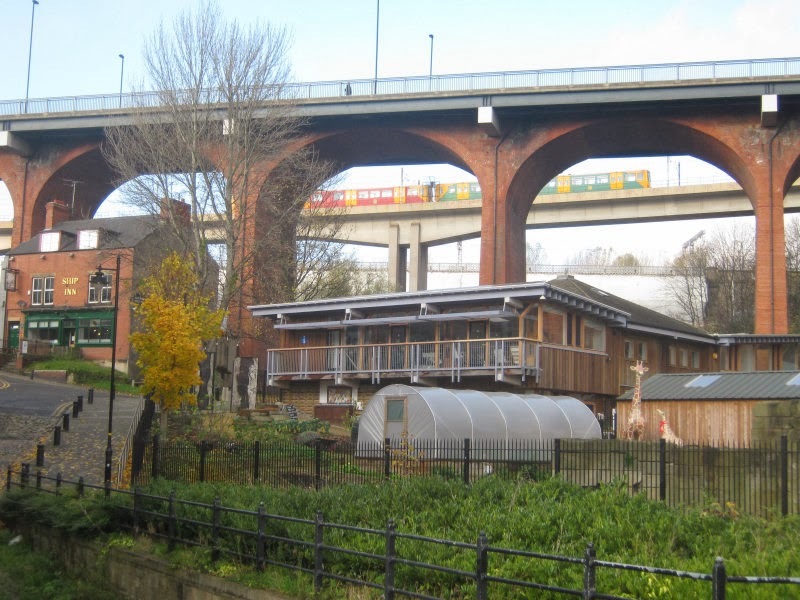 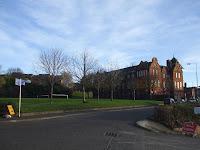 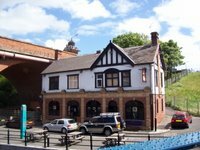 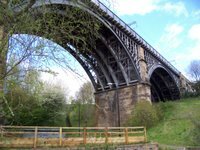 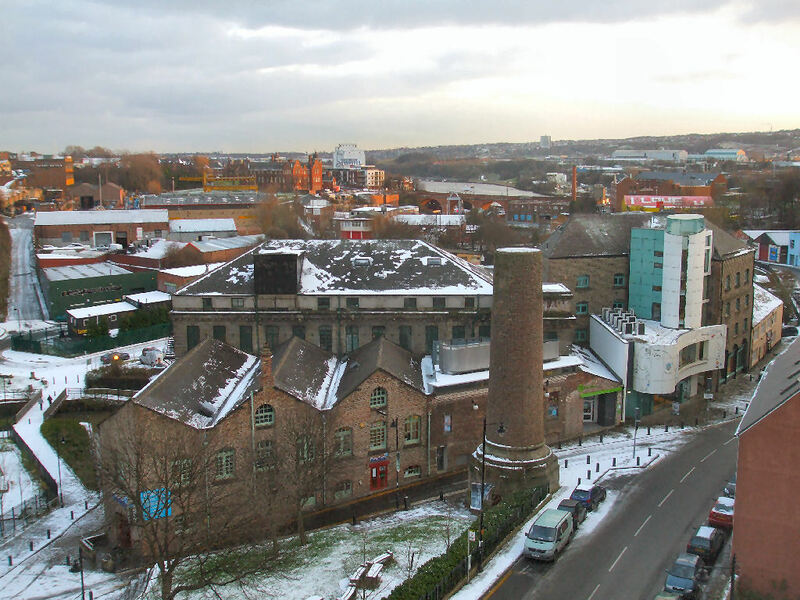 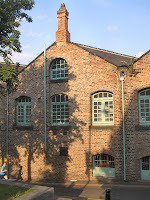 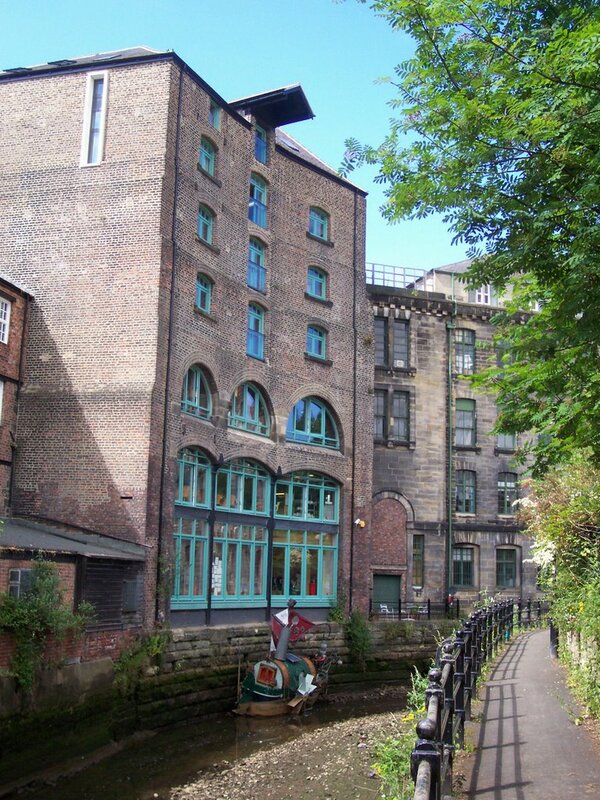 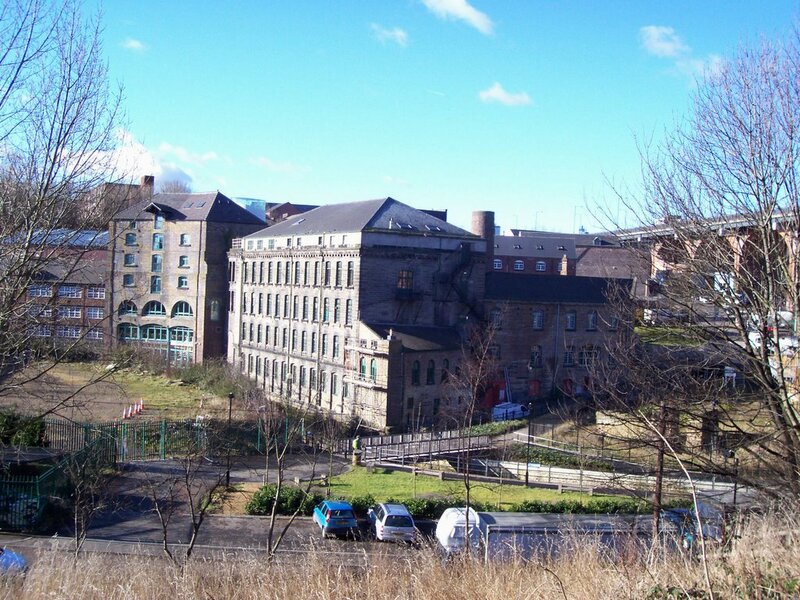 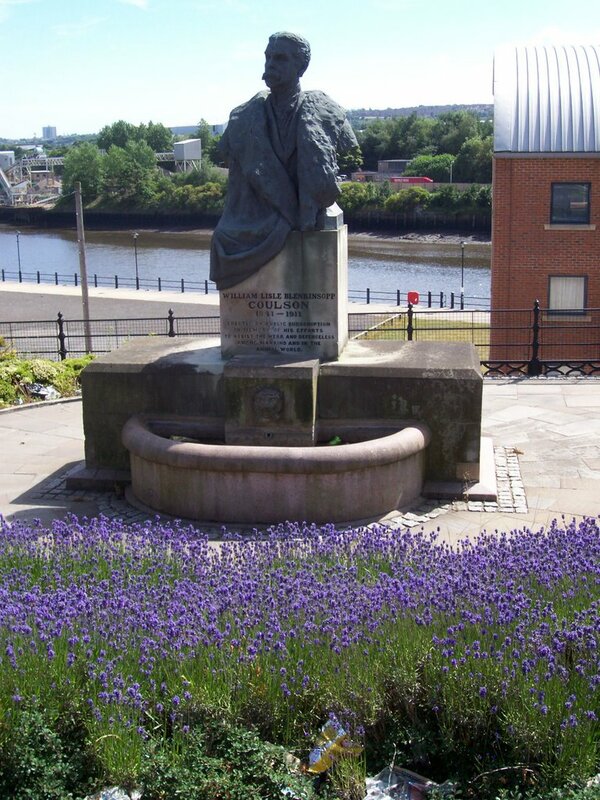 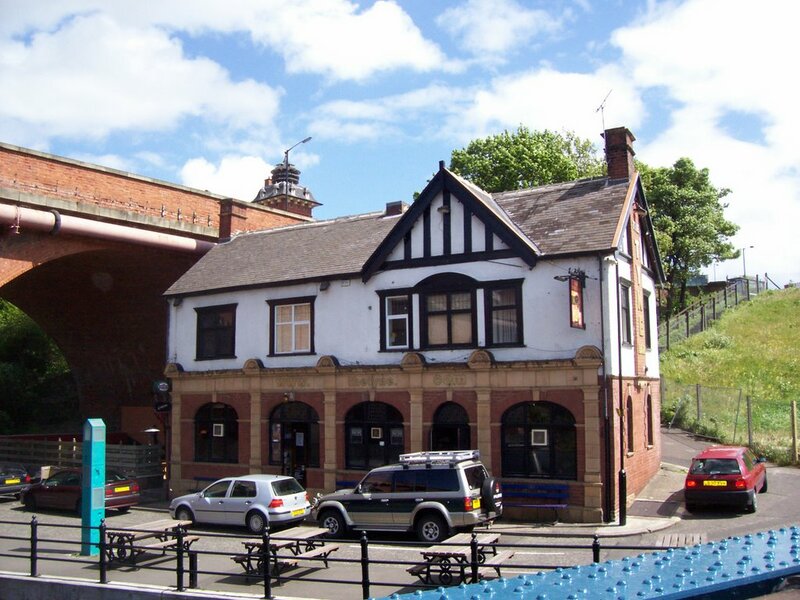 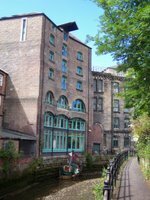 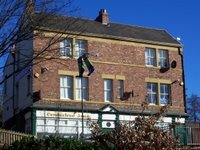 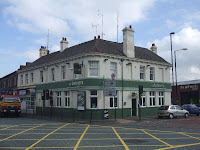 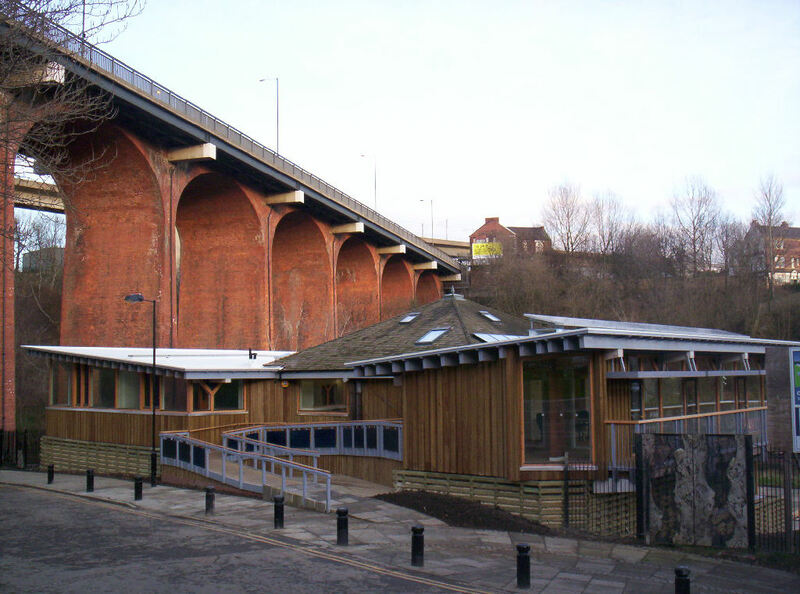 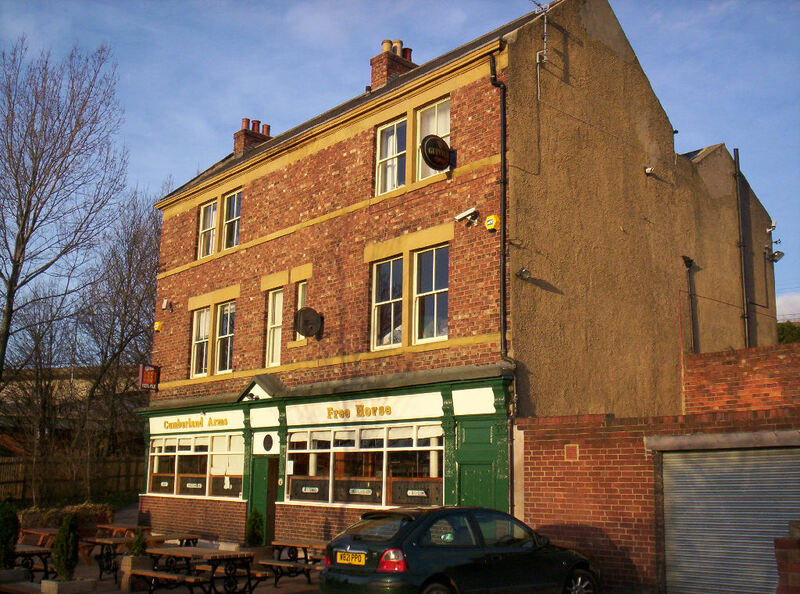 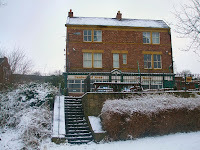 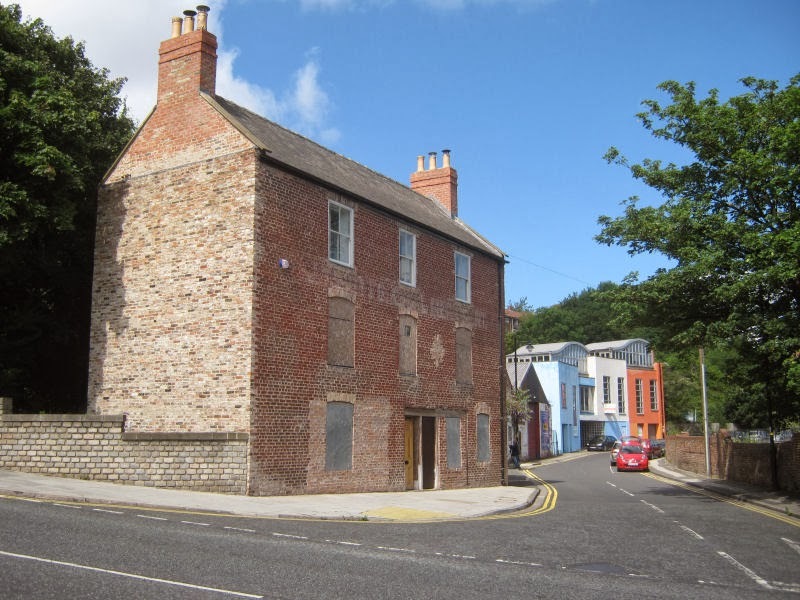 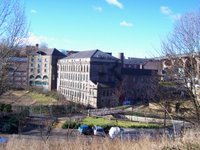 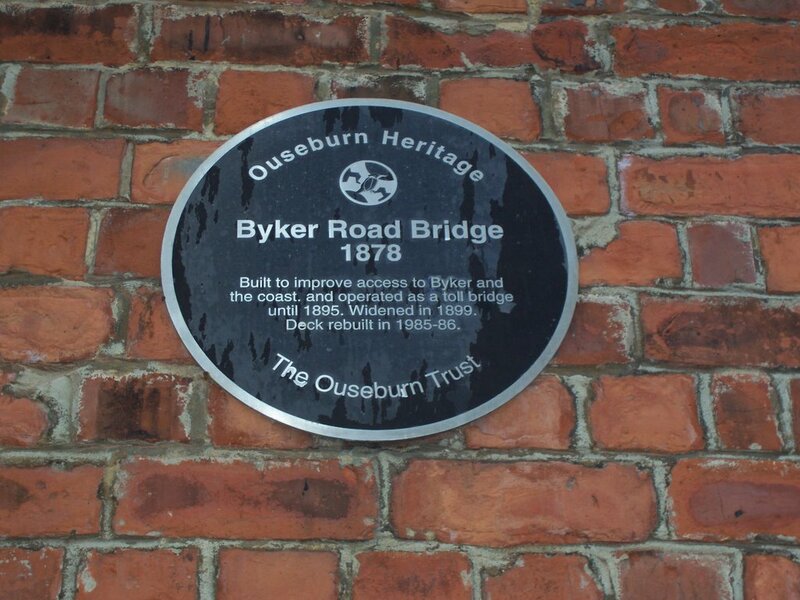 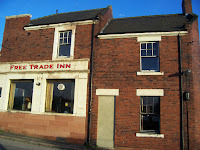 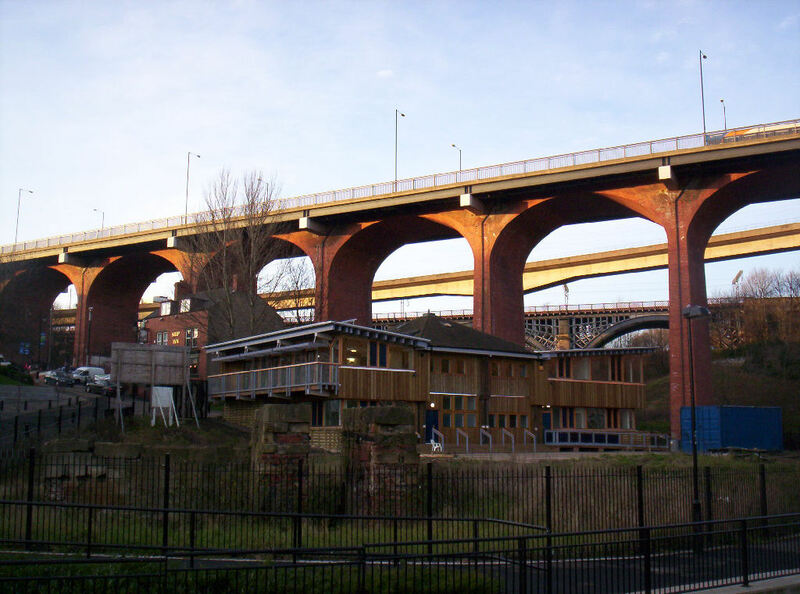 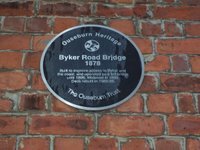 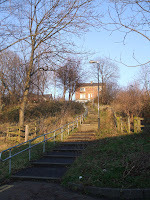 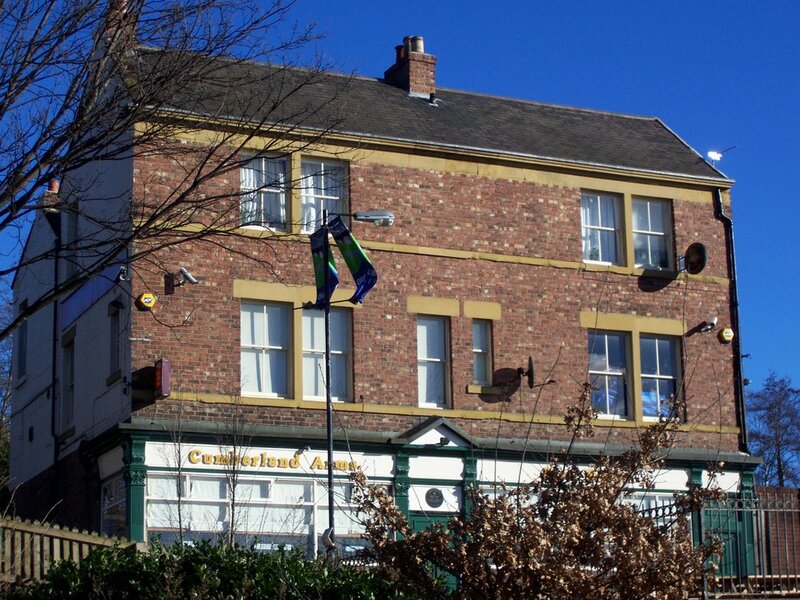 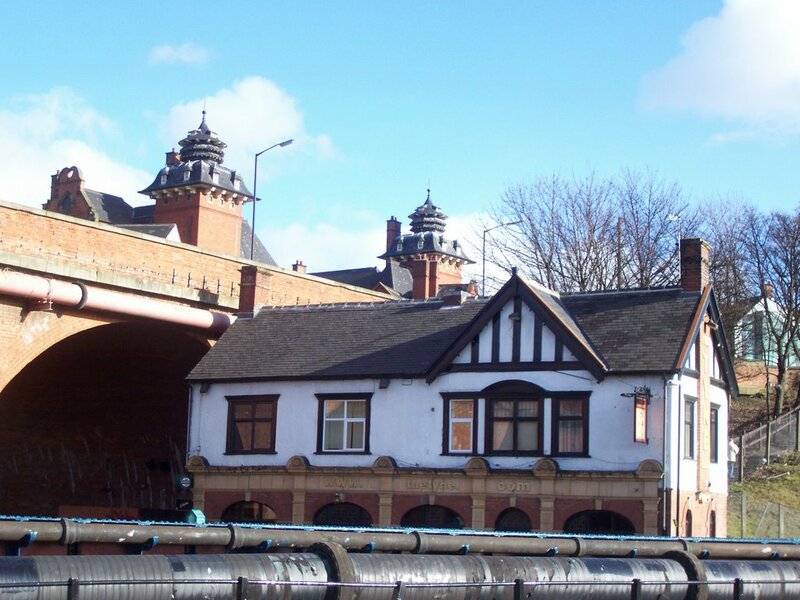 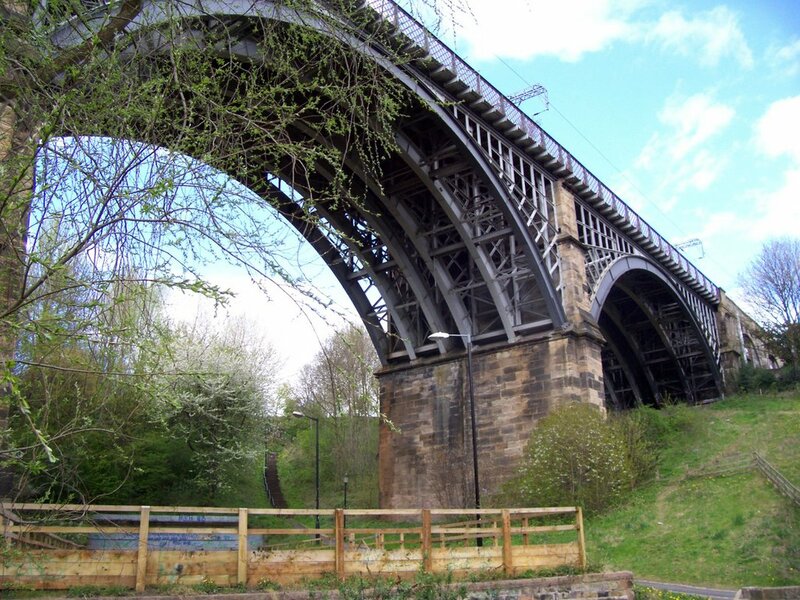 The Trust remains a landlord and developer in the Ouseburn, and seeks to involve people in the heritage and regeneration of the area through its programme of free walks, talks and volunteering activities. Built in the early to mid-eighteenth century and now a listed structure and reputedly Newcastles oldest surviving bridge. 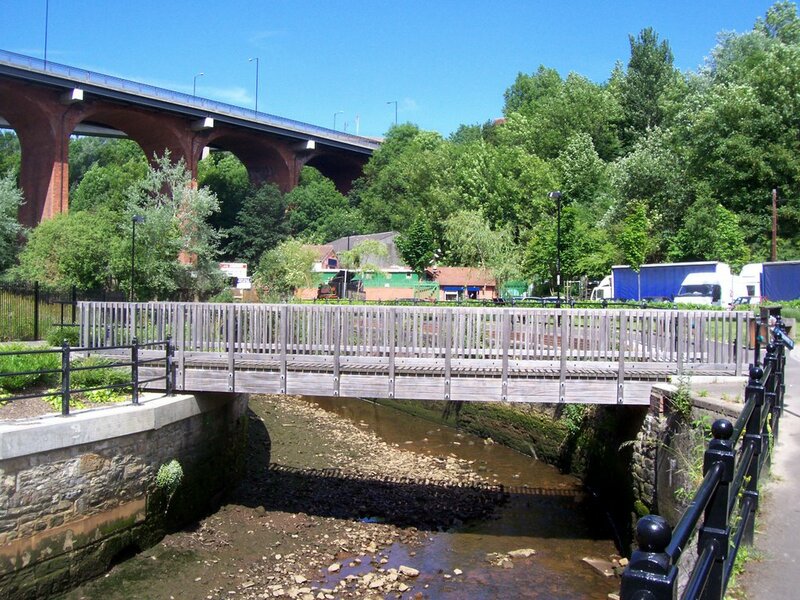 The three biggest bridges cross the Ouseburn Valley at this point. 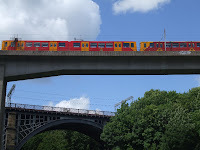 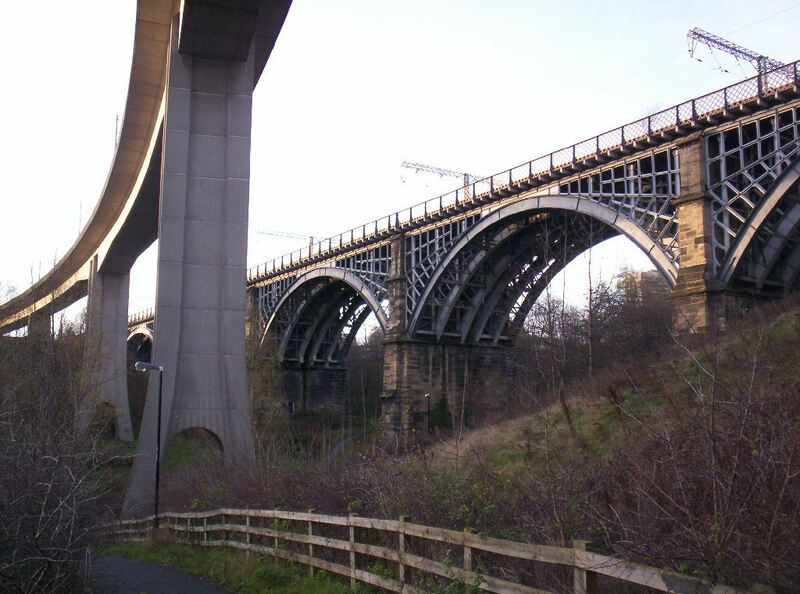 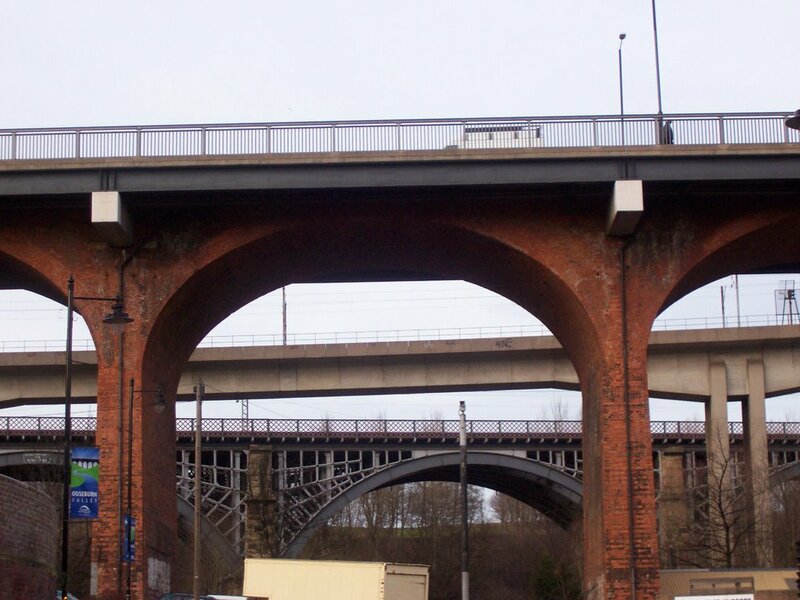 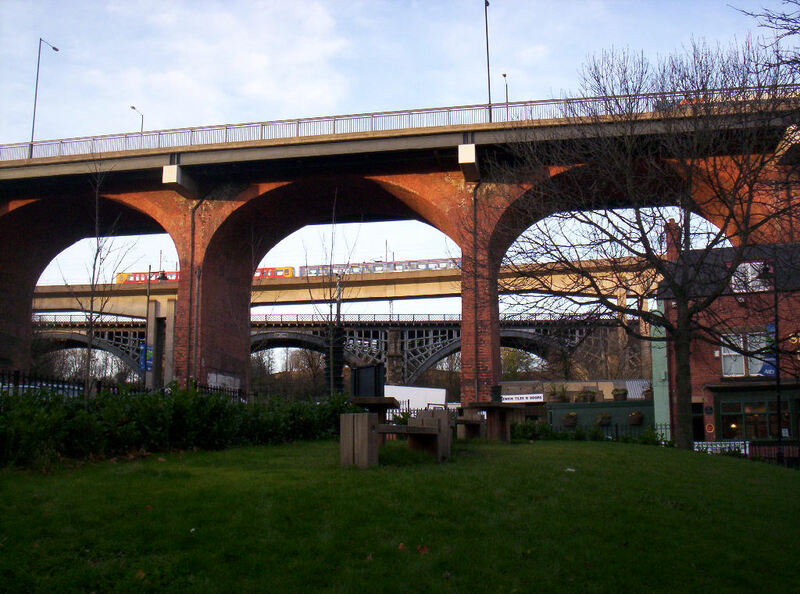 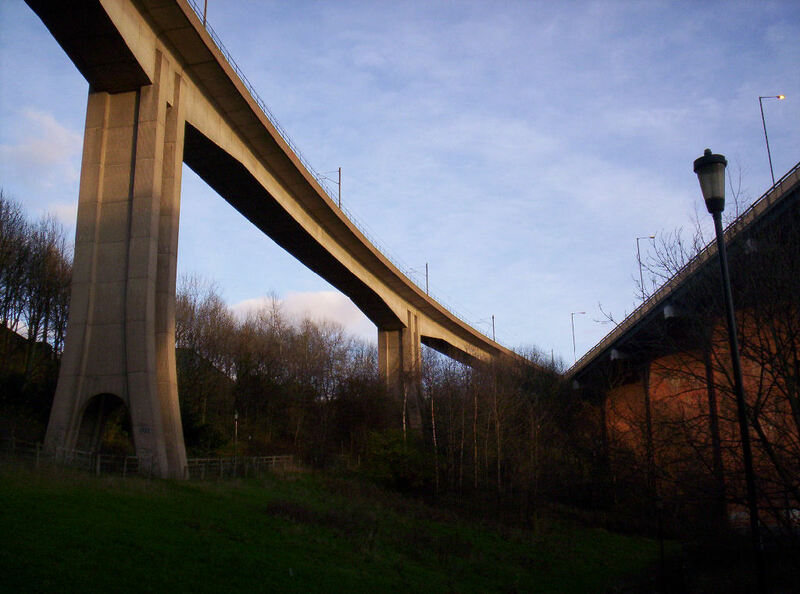 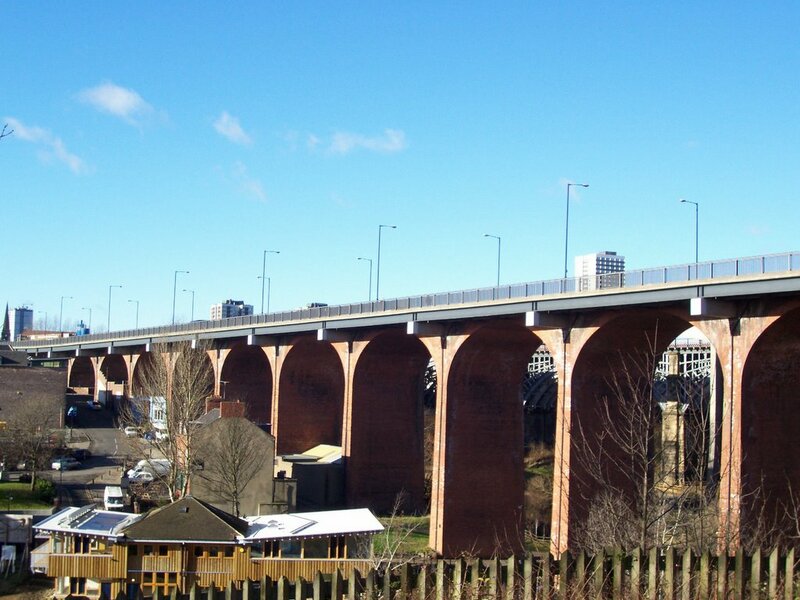 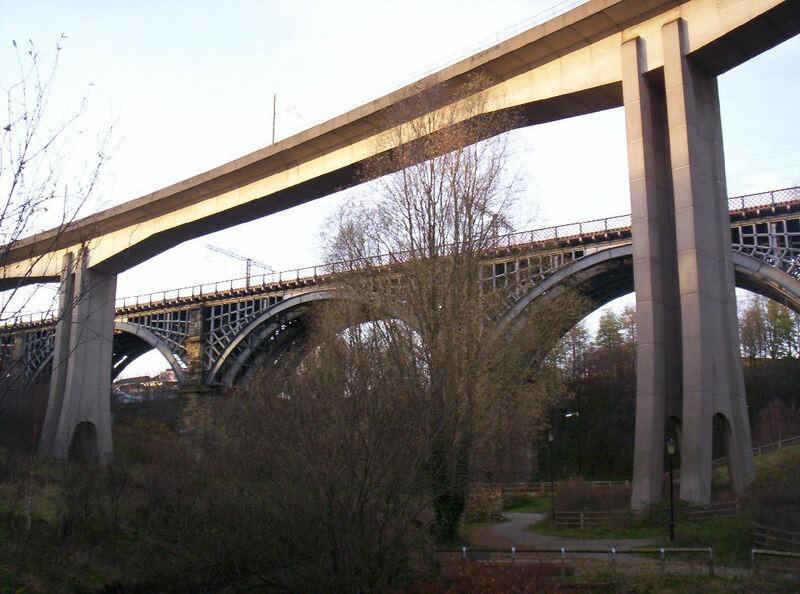 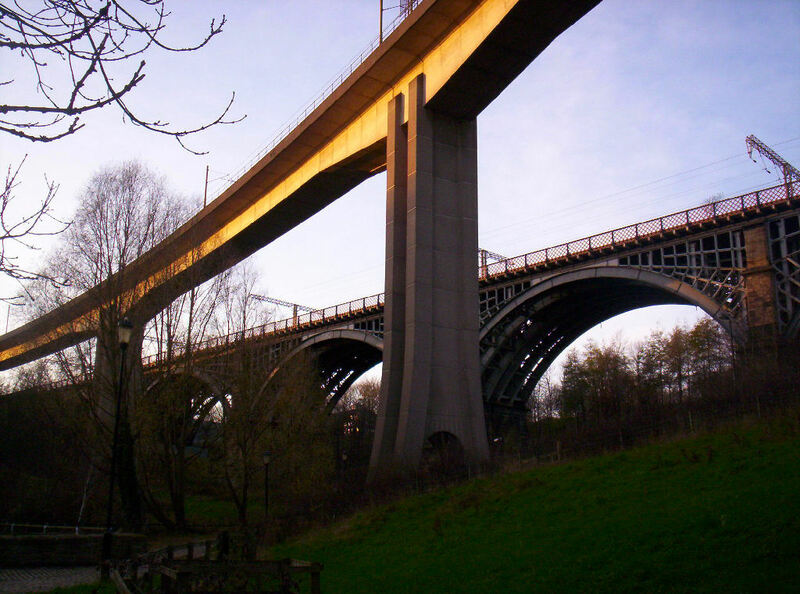 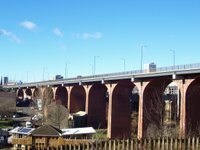 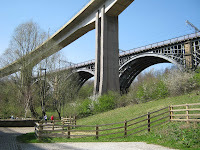 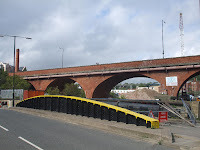 The Ouseburn Viaduct (train), Byker Bridge (road traffic) and the newer Metro bridge. 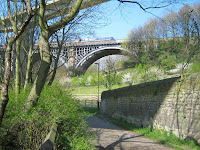 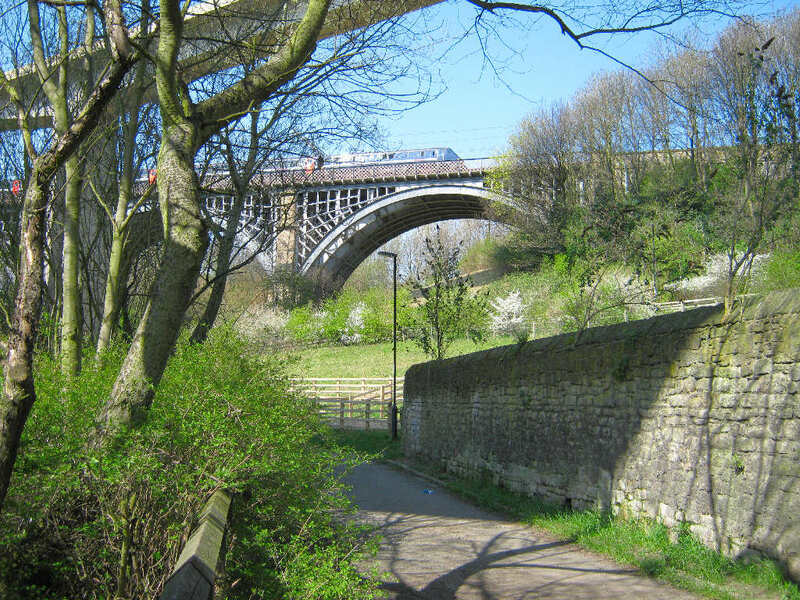 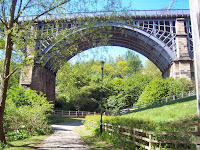 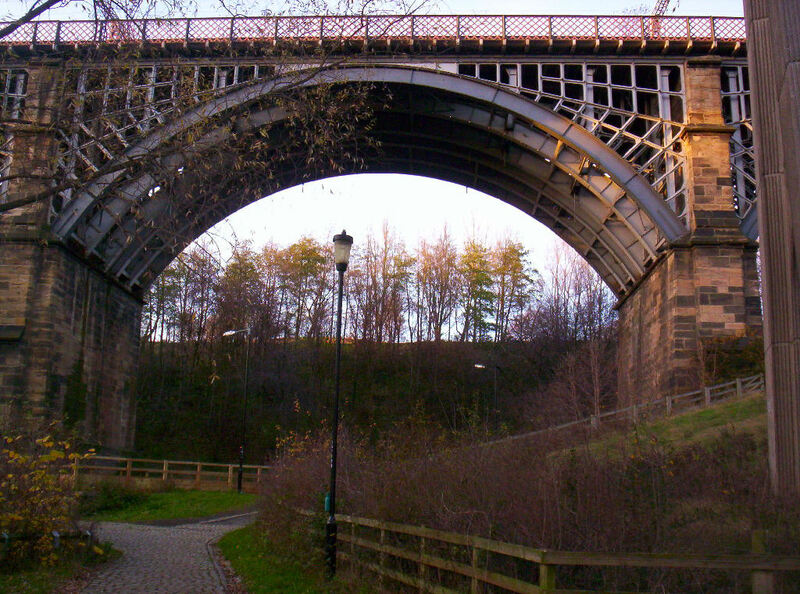 Landscape photo looking at the old railway viaduct crossing the Ouseburn valley. 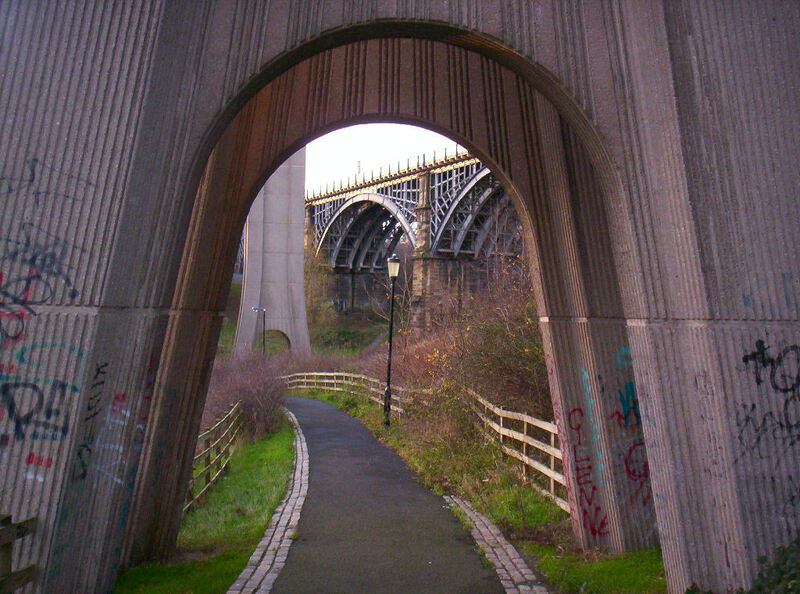 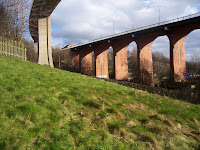 Landscape photo looking at the Ouseburn Viaduct. 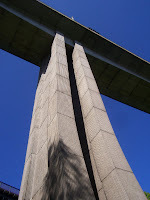 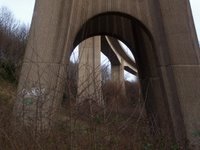 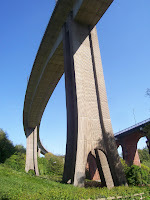 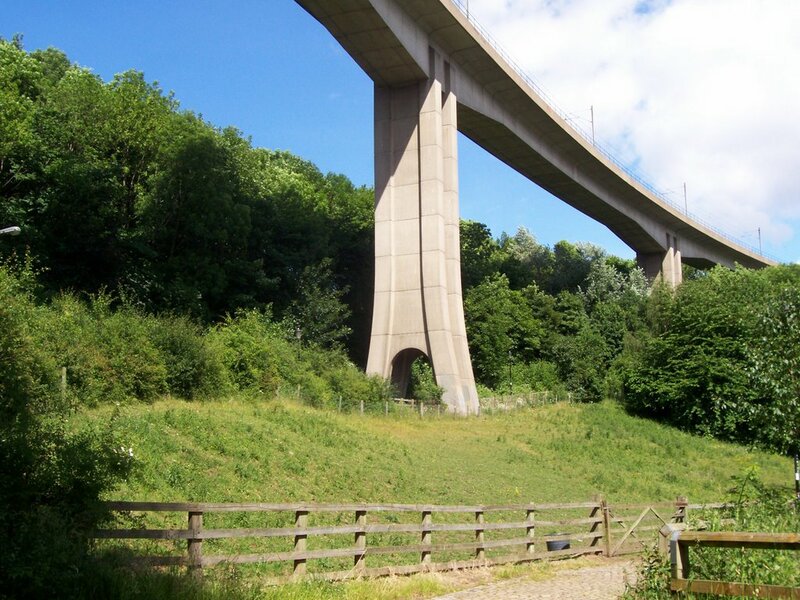 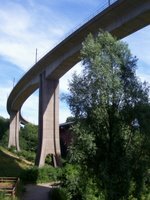 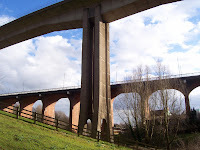 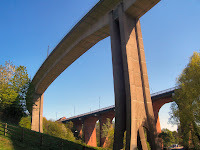 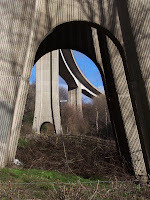 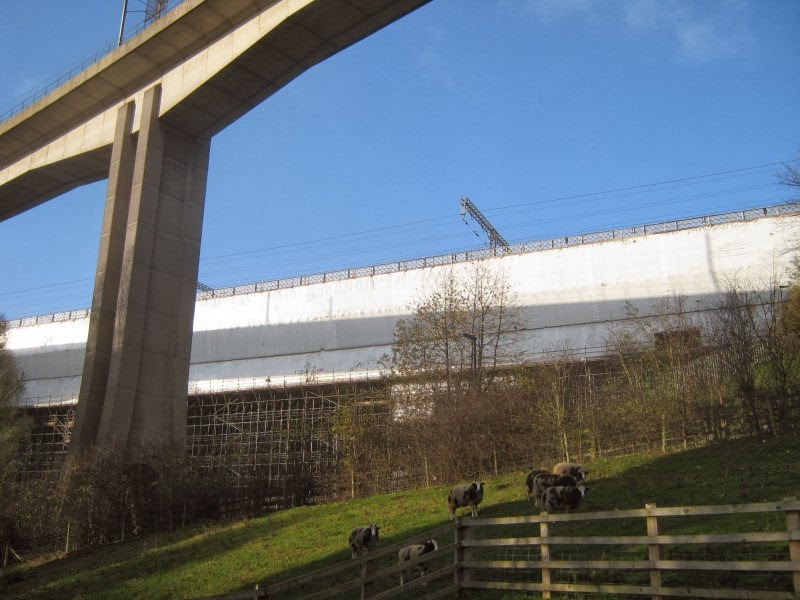 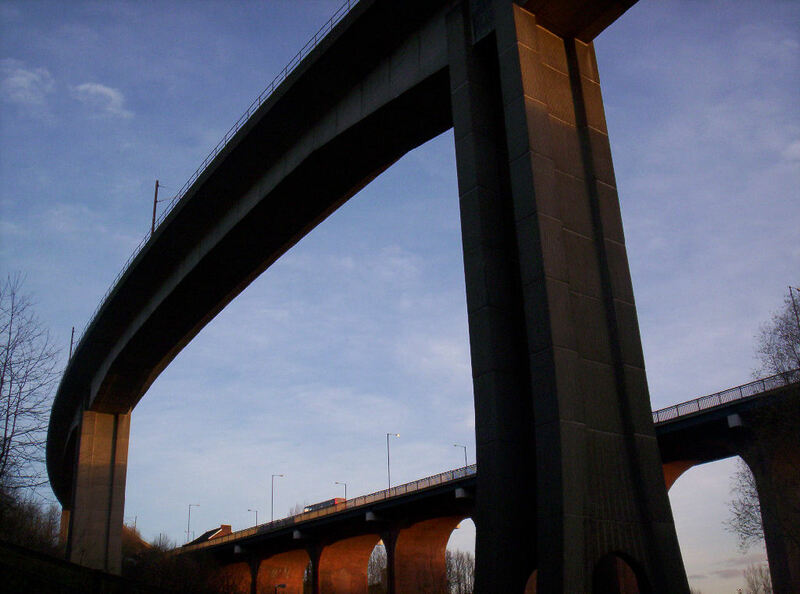 Landscape photo looking at the Ouseburn Viaduct from below. 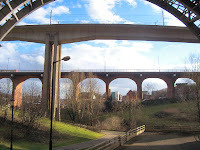 Landscape photo looking at Crawford's Bridge and the Ouseburn Viaduct. 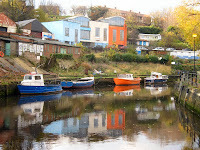 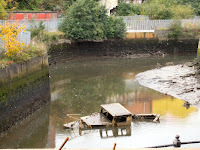 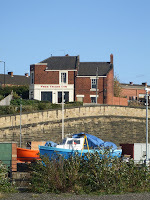 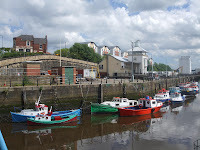 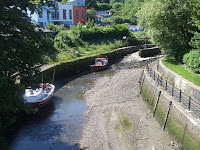 Landscape photo looking at a quay lining the Ouseburn at Byker. 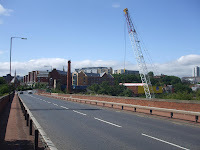 Landscape photo looking at the start of construction work on the Byker Metro Bridge. 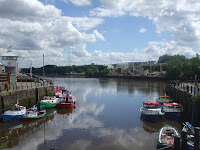 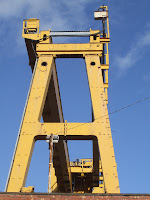 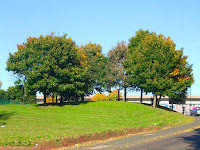 Landscape photo looking at the pier bases for Byker Metro Bridge. 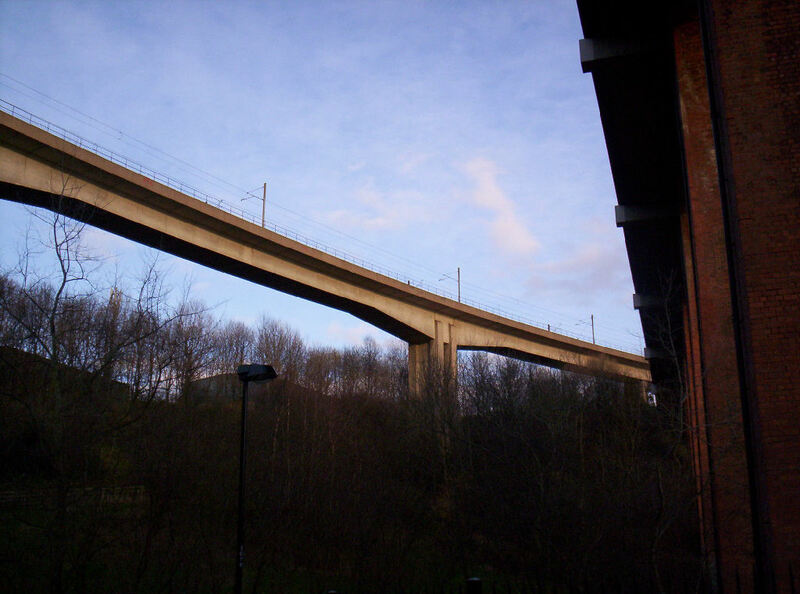 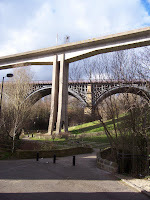 Landscape photo looking at the construction of the Byker Metro Bridge. 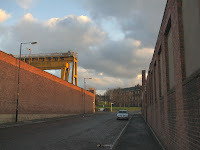 View from the east. 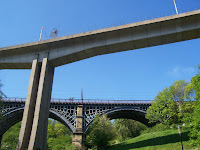 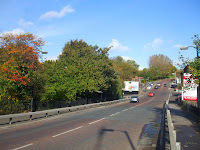 Landscape photo looking at Byker Metro Bridge. 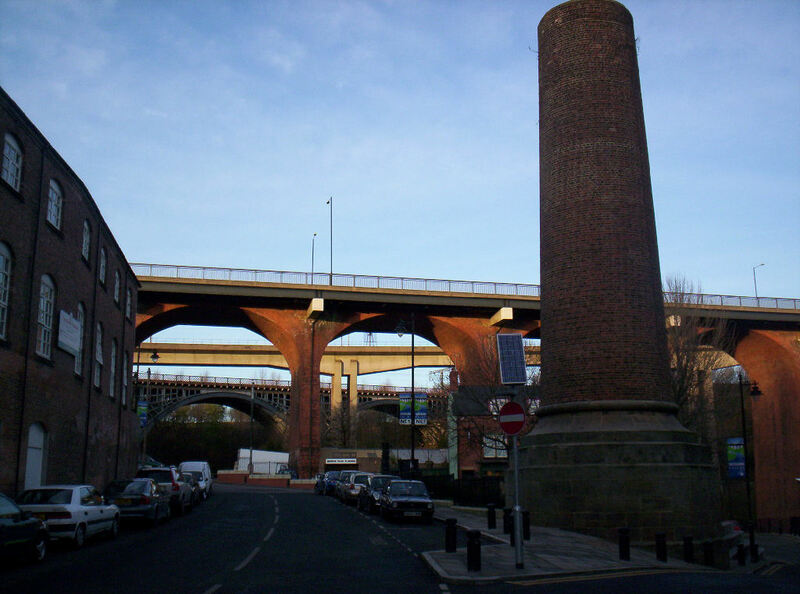 Portrait photo looking at the Byker Bridge and Ouseburn Viaduct, with the remains of a probable works building in the foreground. 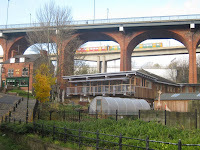 Thanks to Phil Thirkell here is a video of The Ouseburn Trust Heritage Group, featuring Phil, receiving the Journal Culture Club Award 2006 for its tours of the Victoria Tunnel. 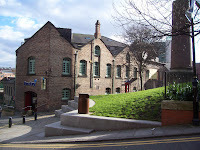 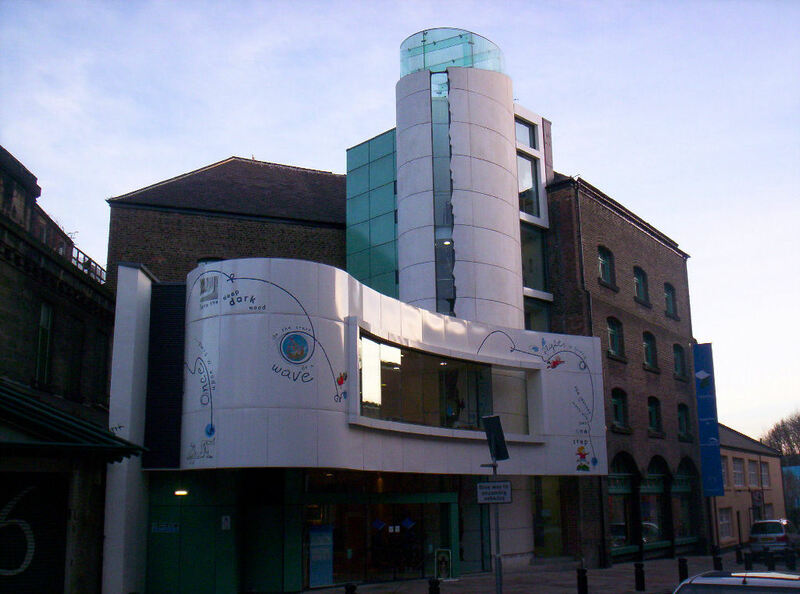 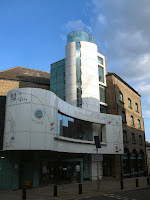 The award was made at Northern Stage in Newcastle upon Tyne. 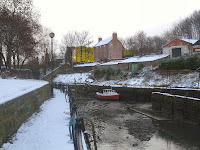 Ouseburn. 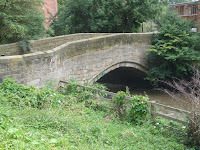 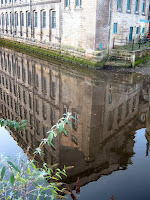 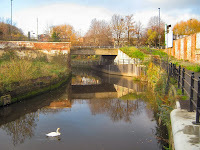 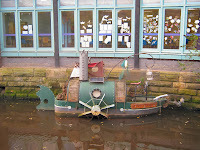 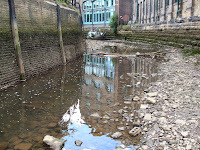 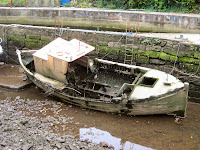 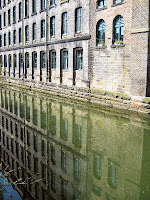 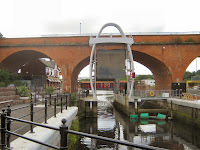 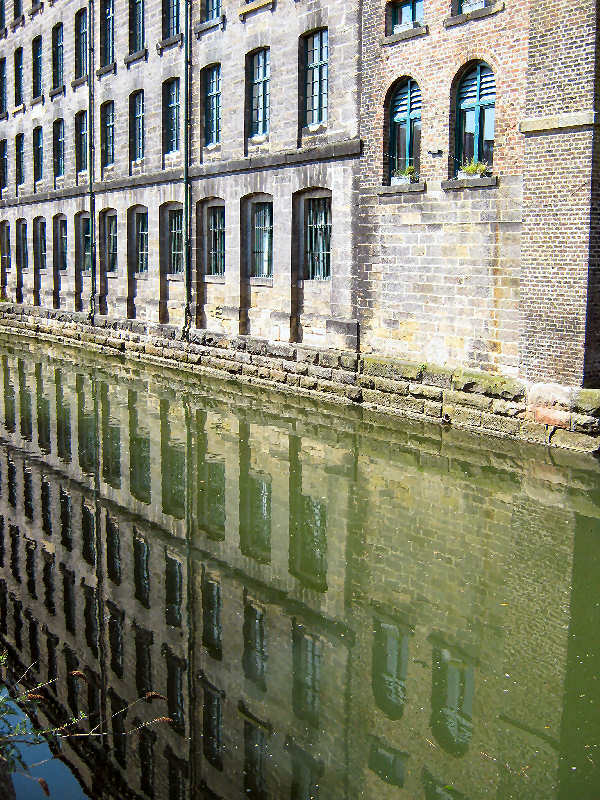 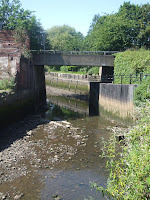 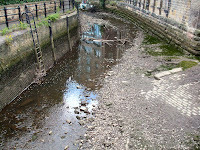 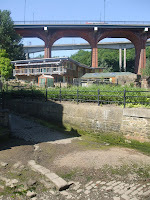 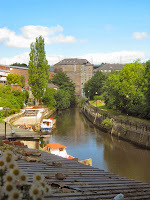 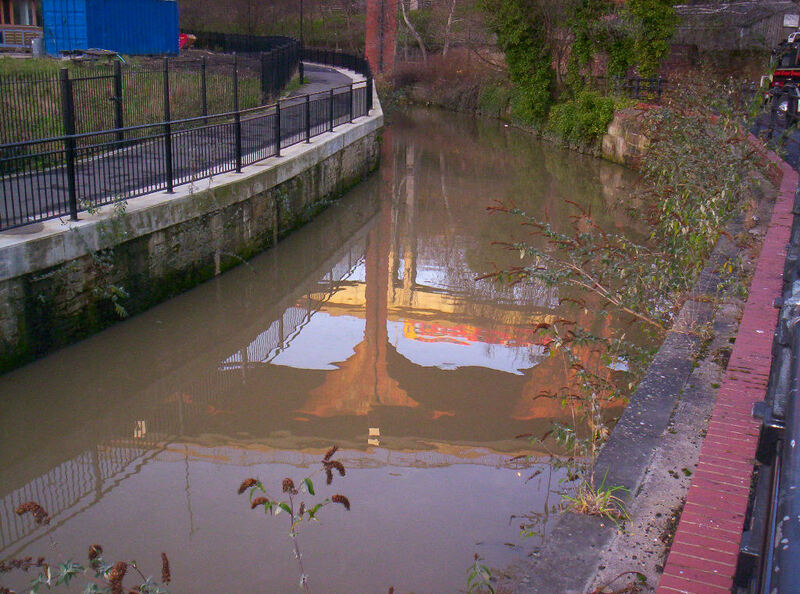 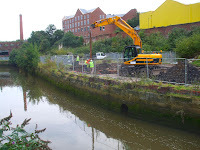 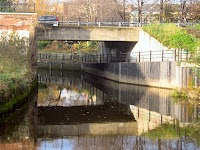 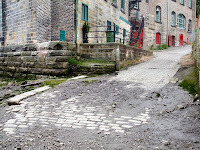 Lots of photos of the Ouseburn and its tributaries. 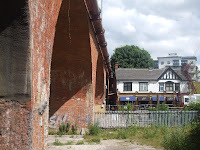 Below the streets, a tunnel into our history. 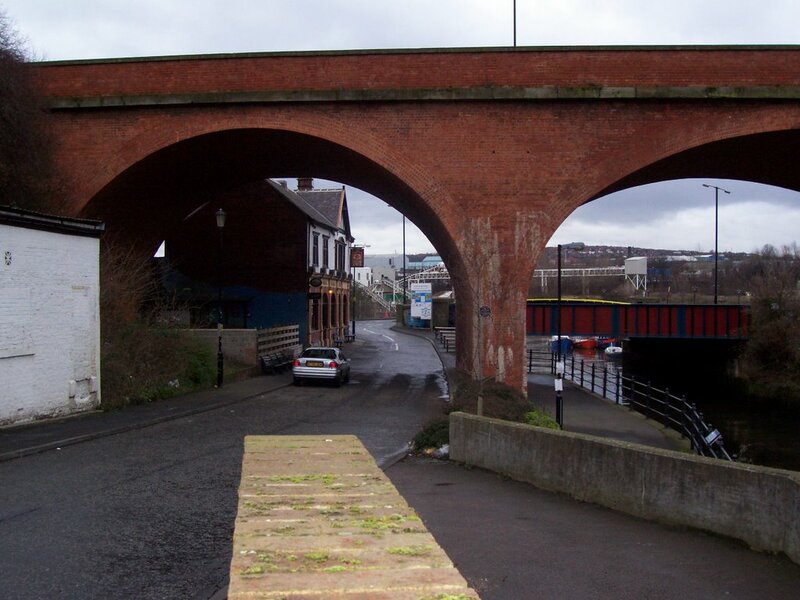 An article on the Victoria Tunnel from the Evening Chronicle featuring a video. 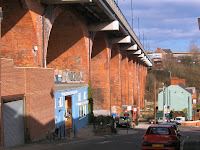 Victoria Tunnel, Newcastle-upon-Tyne. 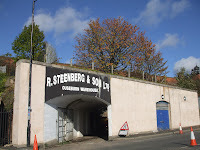 Photos taken inside the tunnel in 1977. Ouseburn Catchment Plan. 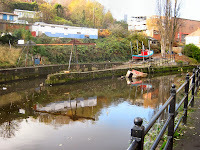 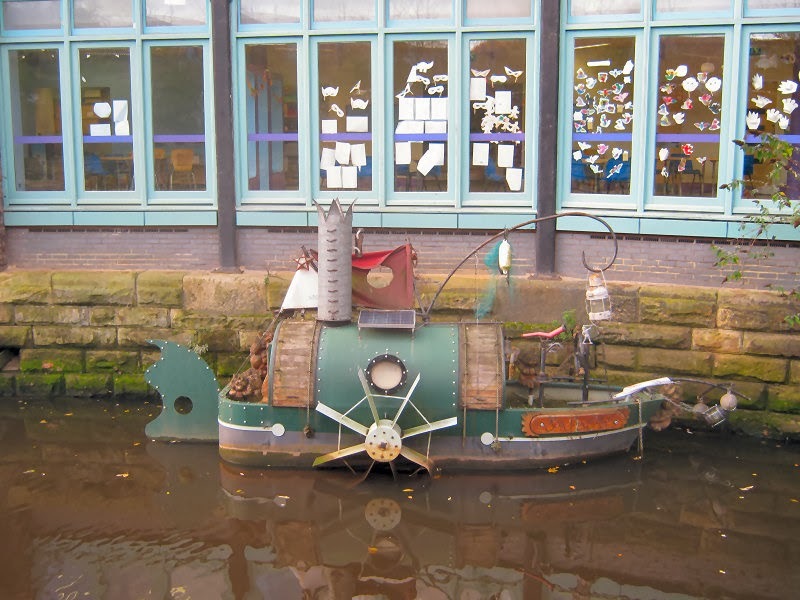 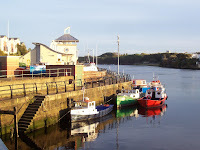 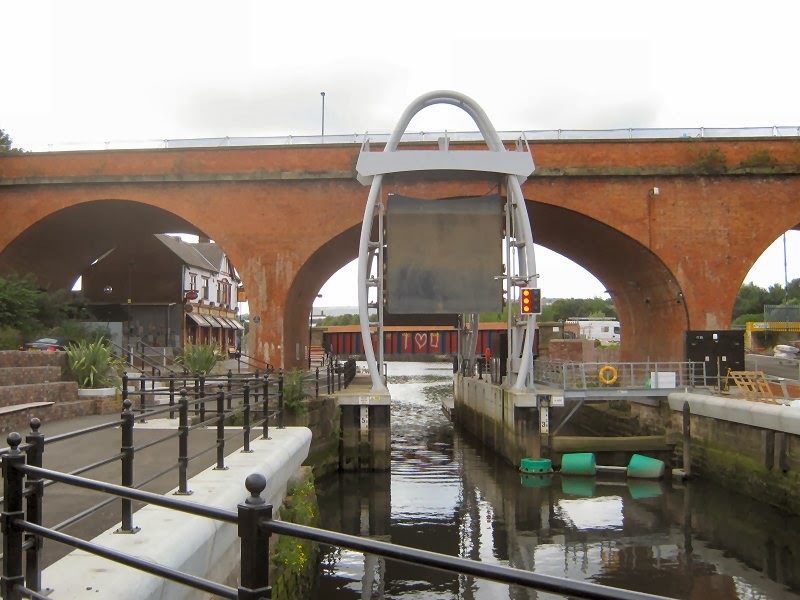 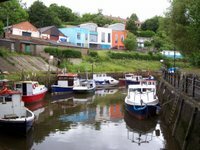 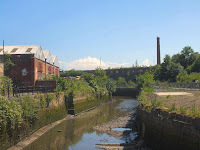 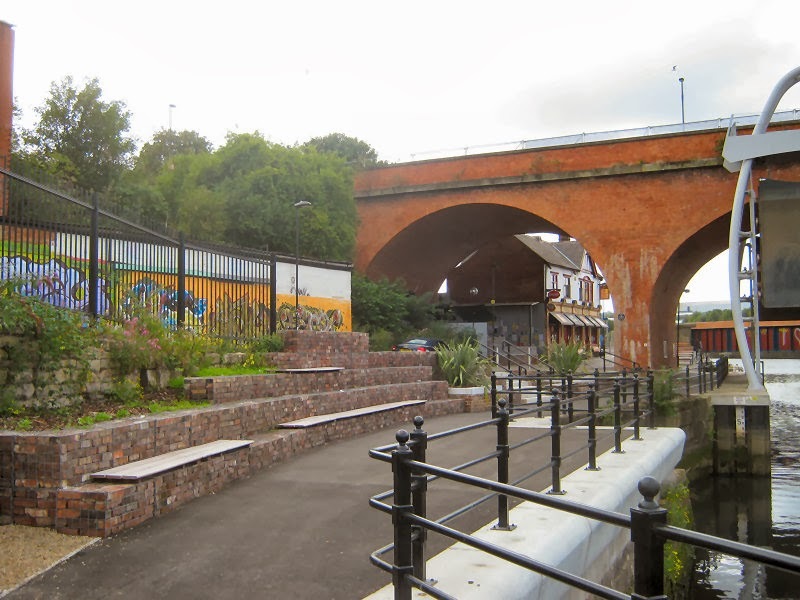 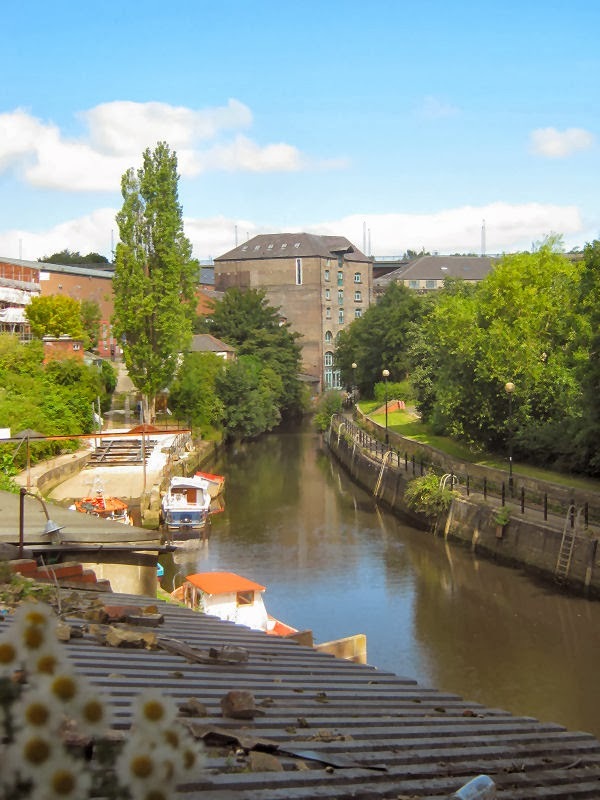 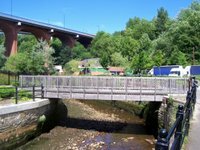 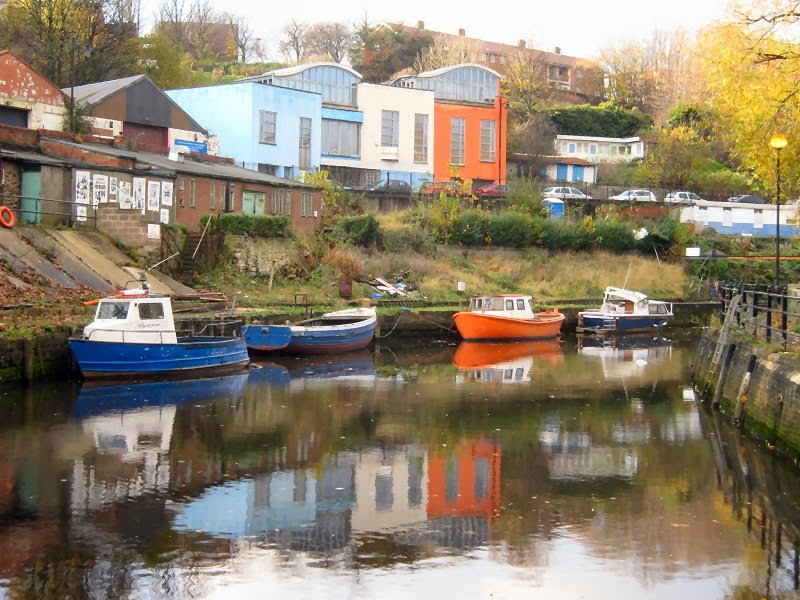 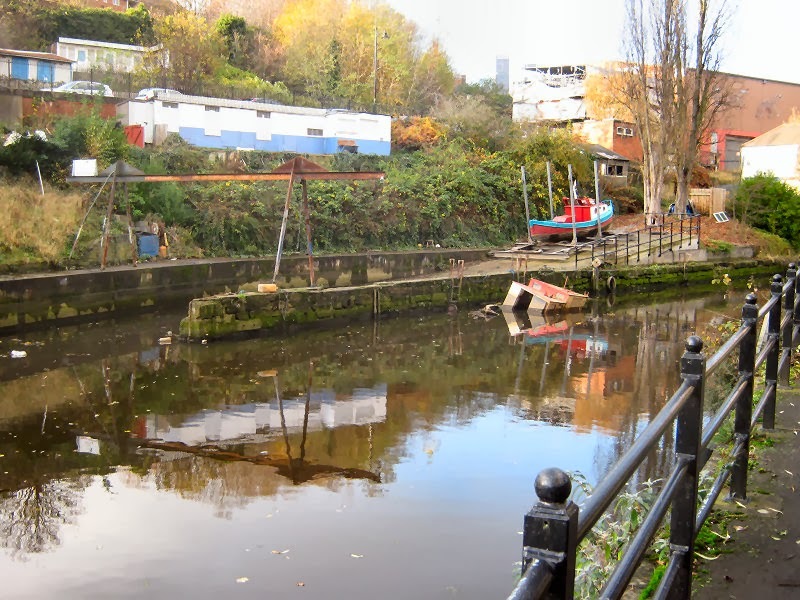 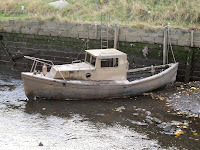 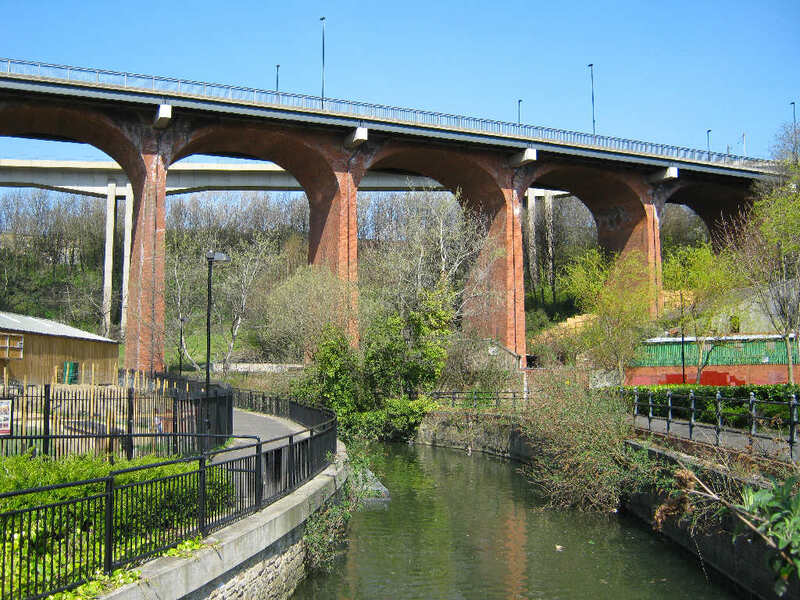 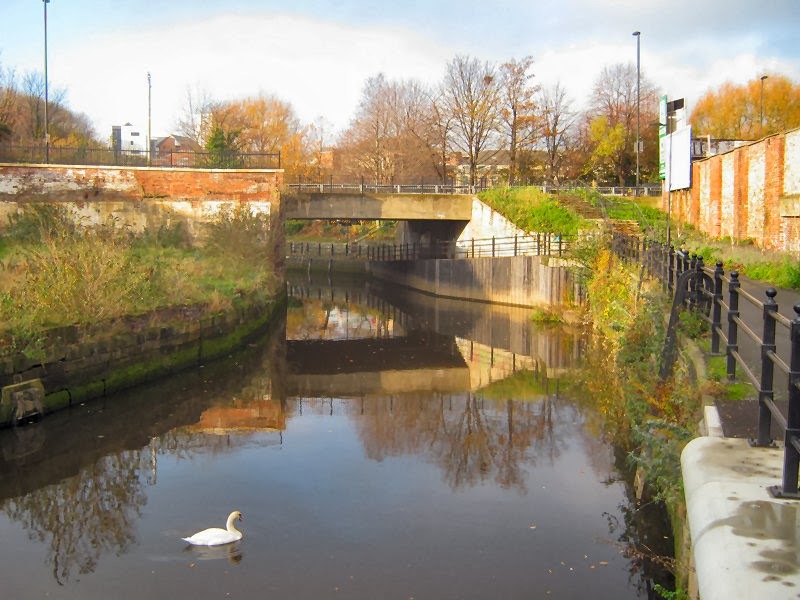 The Ouseburn Steering Committee proposes a blog to give a space to the public to react, discuss, talk about any issues related to the Ouseburn river in Newcastle-upon-Tyne.